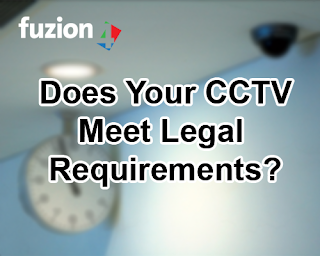 Fuzion4 Blog: Is Your Business's CCTV System Currently Meeting Legal Requirements? Is Your Business's CCTV System Currently Meeting Legal Requirements? Who is in charge of changing the time on your CCTV? Does anybody in your company know how to change the time on your CCTV system? Did you know? It is a legal requirement to make sure that your CCTV displays the correct time and date. 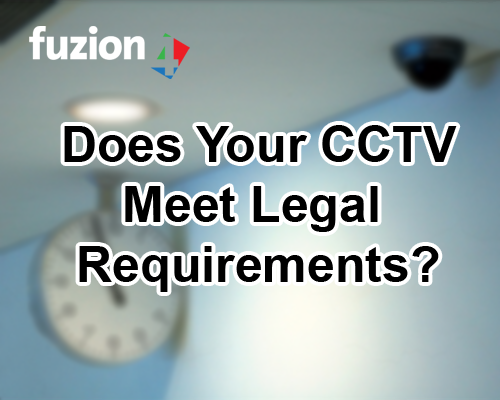 If the CCTV footage displays an incorrect time, it could result in the whole case being thrown out of court. An alarming amount of companies do not change the time on their CCTV systems making them what is essentially an expensive deterrent only. So why is it such a big deal that the CCTV displays the right time or not? If the CCTV’s time is out by an hour, a suspect can claim that he was somewhere else when the incident happened. You would have supplied false evidence, thus falsely proving their innocence. The criminal will walk free to commit more crimes. Imagine that your business had been broken into and thousands of pounds worth of equipment were stolen. Imagine that you have spent all this money on a CCTV system, which has captured the whole incident in full colour. It shows the burglar's face and his getaway vehicle. You would be pretty annoyed at being targeted, but relieved that you have evidence needed to gain a prosecution. Now imagine the agony of being told that the CCTV footage cannot be used as evidence because the time on the CCTV is incorrect. All that time and money you have invested, all gone to waste over a simple thing and what will your insurance company say? They may use it as a reason to not pay up because your system was not properly maintained! Has the clock on the CCTV system ever been changed? Do you even know if it is currently correct? Who is responsible for checking that it has been updated? If someone is responsible for this, what reminders are in place to ensure the update is done? How long would it normally take to realize that the clock has not been changed? Does anyone know HOW to change the clock? Even if you pay for an automated clock, have you checked that it is accurate? It is also a great idea to set a calendar reminder for the start and the end of the British Summer, time to change the CCTV time for the respective times. And finally, go and check your CCTV system now to make sure that it has the correct time. I think the potential profits come along with new technology and those people or companies who are able to implement it will win the market. For instance, virtual data room companies are known to replace old-fashioned ineffective physical data rooms. Hello! Thank you for this post! I want to install a couple of cameras in my store. Could you tell me, please, who should set them? Locksmiths or someone else? Have you ever hired these locksmith for a job http://locksmithwalocksmith.com/? Thank y for this interesting article. it's very important to understand how it works in real life. A disturbing measure of organizations don't change the time on their CCTV frameworks making them what is basically a costly obstruction as it were. On the off chance that the CCTV's opportunity is out by 60 minutes, a suspect can assert that he was elsewhere when the episode happened. You would have provided false proof, in this manner dishonestly demonstrating their honesty. The criminal will walk allowed to carry out more wrongdoings.